Founded in 2011, New College of the Humanities (NCH) based in Bloomsbury, London, has earned a reputation as a world-class academic institution that is leading the way in UK higher education. In 2015, The Times described NCH as offering ‘bespoke higher education’ and as being positioned ‘at the forefront of a new era, the academic equivalent of space travel’, with our one-to-one tutorial system giving NCH ‘the edge on even Oxbridge’s one-to-two tutorial system in one crucial way’. 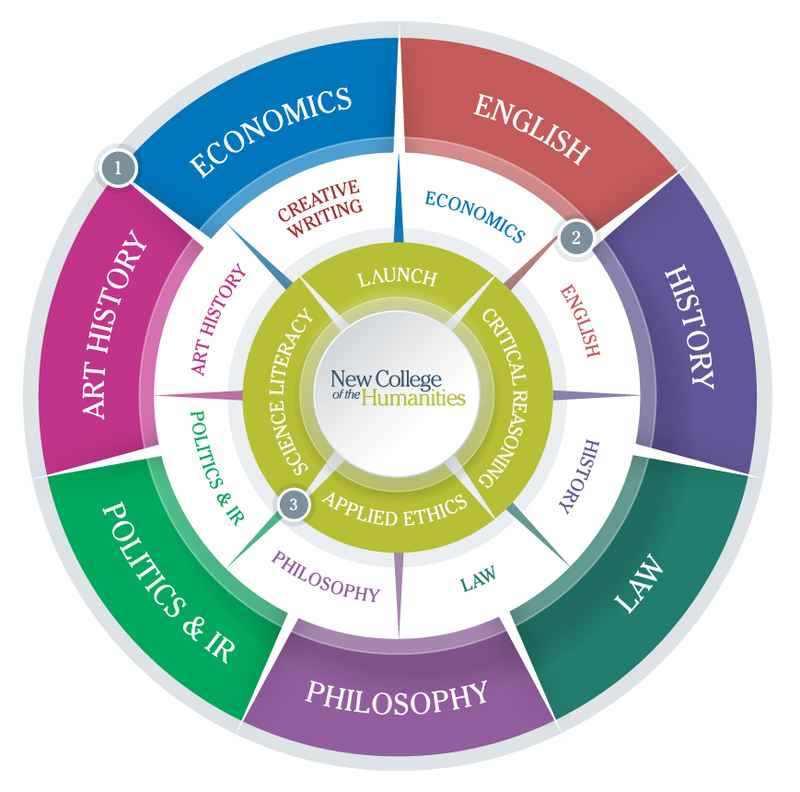 NCH offers a unique liberal arts-inspired undergraduate curriculum taught to small groups and through the one-to-one tutorial system that is the gold standard of a humanities education. Undergraduates choose a combined honours degree comprising a ‘major’ subject and a complimentary ‘minor’ subject, from any two of Art History, Economics, English, History, Single Honours Law LLB, Combined Honours Law LLB, Philosophy, and Politics & International Relations. We also offer Philosophy, Politics & Economics (PPE) and Philosophy, Politics & History (PPH) combinations and Creative Writing as a minor option. All students at NCH combine their degree studies with the College’s enriching diploma, which is designed to provide the insights required to lead a rewarding and fulfilling life and offers exceptional professional development opportunities. The NCH Diploma is awarded to graduates in addition to their degree and sets them apart from their peers by marking the greater depth of their education. NCH students benefit from one of the best staff-to-student ratios in UK higher education and experience a minimum of 13 contact hours per week with our academics. In comparison, humanities and social science students at Russell Group universities experience an average of 9.85 contact hours per week HEPI, 2014). Teaching at NCH is delivered through one-to-one tutorials, small group seminars and interactive lectures of between 10 and 60 students, meaning that all voices are heard and all questions debated. Our teaching faculty is comprised of inspiring and experienced academics who have a passion for teaching and are active in research. NCH’s world-class professoriate includes luminaries such as Simon Blackburn, Sir Partha Dasgupta, Richard Dawkins, Daniel C Dennett, AC Grayling, Bettany Hughes, Lawrence Krauss, Steven Pinker, Sir Christopher Ricks, and Adrian Zuckerman, all of whom teach and contribute to the creation and development of the curriculum at the College. Between them, they deliver approximately 100 lectures in each academic year at NCH, giving our students access to some of the world’s greatest thinkers that is unparalleled at the undergraduate level. In 2015, the degree results of our first graduates surpassed the national average, with over 30 percent securing a first class degree in a humanities subject and over 83 percent attaining an upper second-class degree or above. * Destinations included Clifford Chance, Lambert Smith Hampton, Belarus Free Theatre, Deloitte, Porsche, Diageo and the British Council. Others progressed to postgraduate study at top universities including the University of Oxford, UCL, and LSE. Since the College’s inception, NCH has developed a reputation for delivering an unrivalled university experience. In 2015, NCH was awarded best ‘Course & Lecturers’ at the Whatuni? Student Choice Awards, and came fourth in the overall ‘University of the Year’ category. In 2014, 63 percent of NCH students – more than twice the comparative statistic for Russell Group university students studying the humanities – stated that the NCH academic experience exceeded their expectations (HEPI, 2014). * In 2014, 20 percent of students across the UK secured a first class degree, with 72 percent achieving an upper second-class degree or above (HESA). NCH has earned a reputation as a world-class academic institution that is leading the way in UK higher education. Our students are some of the world’s most enquiring minds and have a passion for learning. Studying at NCH is an enriching pursuit, both personally and professionally, and we consider postgraduate students to play an integral role in the ongoing development of our vibrant collegiate community. Our MA programmes foster advanced skills in critical questioning, information gathering, synthesis and analysis, and oral and written communication. Graduates are likely to pursue a research degree and an academic career, or wider employment opportunities in a range of diverse industries. NCH offers an intensive learning experience and immense opportunities for individual growth. Students who choose to study at the College develop into assured, well-rounded, eloquent individuals with a capacity for independent critical thought and intellectual debate, impressive research skills, a range of interests and passions, and an understanding of how to apply their studies to the world at large. The calibre and diversity of destinations of the College’s first graduates demonstrate the academic and real-world value of the College’s leading-edge approach to broader, deeper, more rigorous higher education. The MA Philosophy provides a rigorous and wide-ranging programme relevant both to those entering formal philosophical study as graduates of other disciplines and to philosophy graduates seeking to consolidate and expand their studies. This master’s programme can be completed in one year (full-time), or stretched over two years (part-time). International students who require a visa are only eligible to study this programme on a one-year, full-time basis.